With just one game separating No. 23 K-State and Kansas, head coach Suzie Fritz’s squad was unable to capitalize in an opportunity to build on their conference lead. The evening fell apart for the Wildcats (20-6, 7-5) as they lost convincingly in a three-set sweep to their in-state rivals, the Jayhawks (19-7, 7-5). 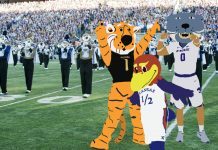 The two teams are now knotted with 7-5 Big 12 records. It’s the longest losing streak for the Wildcats since falling in four straight matches at the end of the 2012 season. Kansas outside hitter Sara McClinton finished with a total of 18 kills and a .500 hitting percentage. 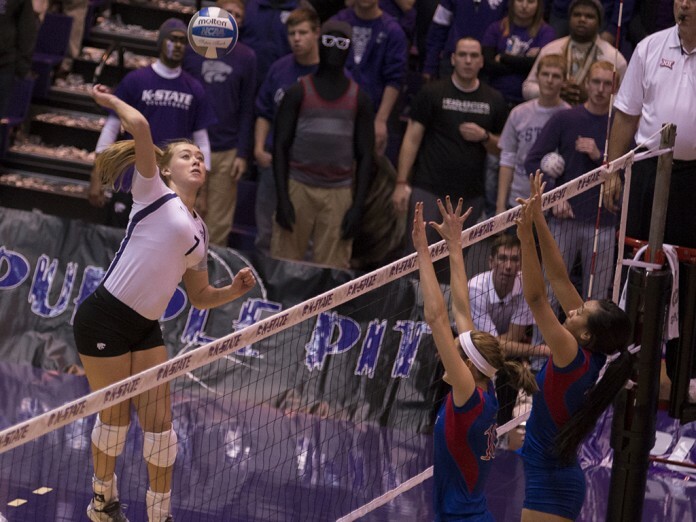 K-State was paced by freshman Kylee Zumach and her 14-kill performance. 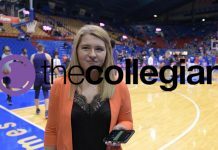 The first match between K-State and Kansas led to a thrilling 3-2 victory for the Wildcats in Lawrence, however, Wednesday night’s match was a different story. In set one, K-State controlled the game early by jumping out to a 14-8 lead but that would be its largest lead. The Jayhawks brought the set back to 21-20 and went on a four-point run behind sophomore setter Maggie Anderson’s serving to ice the set, winning 25-22. Set two was a little closer throughout, with the Wildcats building a four-point lead in their attempt to knot the score. Near the end, Kansas yet again answered with another streak, closing out the second set victory with a five-point run and closing out 25-22. Set three was the one that Kansas had the biggest advantage as it applied most of the pressure. The Jayhawks had many players contributing defensively with digs, keeping rallies going and being able to capitalize offensively to win 25-21. Another lowlight for K-State was their minuscule total of just five blocks. It’s an area that the Wildcats have often found success in as they sit near the top of the conference ranks. Brand finished as the assist leader for the Wildcats with 34 on the night. Defensive specialist Kersten Kober was one of the bright lights on the back line finishing with a solid 17 digs, providing K-State with extra opportunities. Reininger finished the match with 10 kills at a strong .625 hitting percentage.